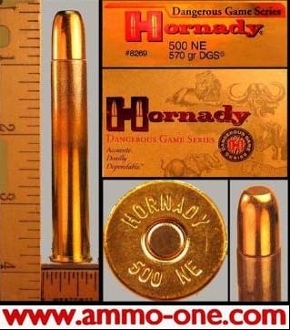 One Cartridge not a box: 500 Nitro Express by Hornady of the USA new production using New Hornady Brass cases with “HORNADY 500 NE” Head-Stamp and loaded with a 570 grain “DGS” or “FMJ” (Full Metal Jacket) projectile. The 500 Nitro Express was introduced in 1890 and was filled with Cordite Smokeless Powder and wasderived from the 500 Express BPE "Straight". BPE means Black Powder Express. * Cordite looks like thin red spaghetti and was later replaced in early 1900's by modern day smokeless gunpowder.